The Iowa Assessments help determine how students are performing on nationwide standards, measuring achievement in Reading, English Language Arts, Mathematics, Science, and Social Studies. The exact tests will depend on grade level. The Cognitive Abilities Test measures thinking and problem-solving skills in three areas linked to academic success: verbal reasoning, non-verbal reasoning, and quantitative reasoning. Year after year, Cathedral graduates are regularly achieving acceptance rate to their families' top choice high schools. 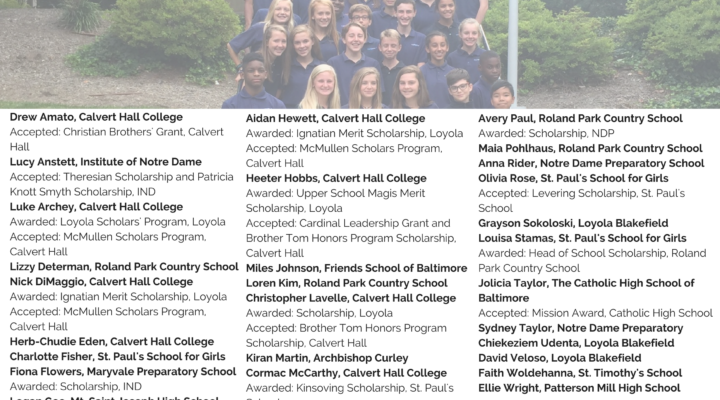 Our graduating class attends many fine area high schools, including Calvert Hall College High School, Loyola Blakefield, Maryvale Preparatory, Notre Dame Preparatory, St. Paul's School, and St. Timothy's School. In 2018, the 8th grade graduates earned an aggregate total of $446,000 in academic scholarships from Catholic and private high schools. Congratulations to the Class of 2018! This fantastic group of young men and women are headed to the following schools next year - we will miss you!